If we already have an EIN number do we need to get another one for a LLC? An EIN number must be in the name of the business entity LLC. 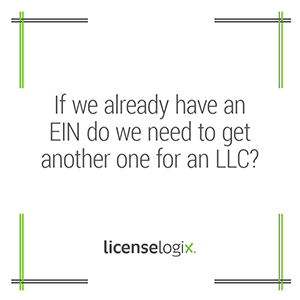 If you already have an EIN number in the name of the LLC, you will not need another one. If you need to obtain an EIN number LicenseLogix is happy to help, you can click contact us, or give us a call at (800) 292-0909 for more information.